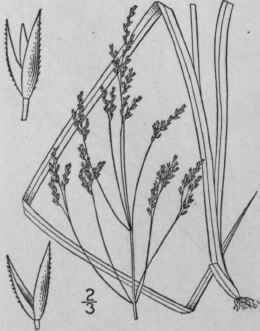 Agrostis rubra L. Sp. PI. 62. 1753. 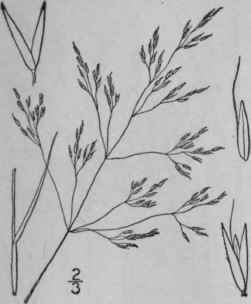 Agrostis borealis Hartm. Scand. Fl. Ed. 3, 17. 1838. 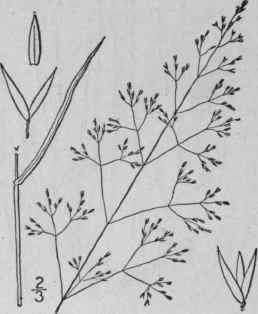 A. rupestris Chapm. Fl. S. States, 551. 1860. Not All. 1785. Agrostis rubra var. americana Scribn. ; Macoun, Cat. Can. Smooth or very nearly so, glabrous, culms 6'-2° tall, erect or sometimes decumbent at the base, simple. Sheaths usually shorter than the internodes; ligule 1" long; blades 2'- 4' long, 1/2"-1 1/2" wide; panicle 21/2'-5' in length, open, the branches generally widely spreading and more or less flexuous, rarely erect, the lower 1'-2 1/2' long; spikelets 1 1/4"-1 1/2' long, the outer scales acute, scabrous on the keel; third scale shorter than the first, obtuse, bearing a usually bent dorsal awn 2"-2 1/2" long, inserted below the middle. Summits of the highest mountains of New England, New York and North Carolina. Europe. Summer. Agrostis paludosa Scribn., of Labrador, differs by an awnless flowering scale. 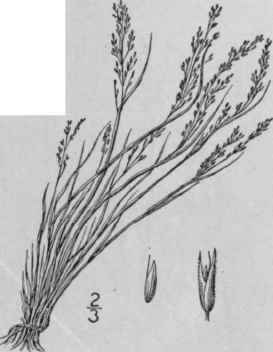 Agrostis geminata Trin. Gram. Unifl. 207. 1824. A. hiemalis geminata Hitchc. Bull. U. S. Dep. Agr. PI. Ind. 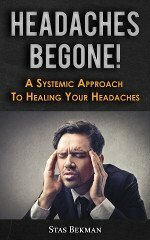 68: 44. 1905. Culms 2'-4' tall, tufted; leaf-sheaths smooth and glabrous, overlapping; ligule 1"-1 1/2" long; blades smooth and glabrous, erect, usually complanate; panicle 2 1/2'-5' long, usually included at the base, its branches very rough, ascending; spikelets about 1 1/2" long, the first scale longer and broader than the second, the third scale about § as long as the first. Labrador to Alaska. This may differ specifically from the true A. geminata Trin. Summer. Agrostis Schweinitzii Trin. Mem. Acad. St. Petersb. 62: 311. 1841. Culms 1°-2 1/2° long from a decumbent or prostrate base, weak, slender, simple or sparingly branched above, smooth and glabrous; ligule 1/2" long; blades 2'-6' long, \"-2" wide, lax, scabrous; panicle 4'-8' in length, open, the branches 1'-2' long, widely spreading, the branchlets and pedicels divergent; spikelets 3/4"-1" long, the outer scales acute, scabrous on the keel; third scale about three-quarters the length of the first, smooth and glabrous, not awned; palet small or wanting. In shaded damp places, Quebec to Wisconsin, south to South Carolina and Kansas. Ascends to 6600 ft. in North Carolina. Panicle usually light green, sometimes purplish. Twin-grass. 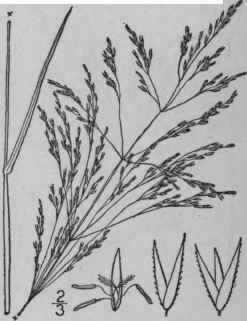 This species was described and figured as Agrostis perennans in our first edition. July-Sept.
Cornucopiae perennans Walt. Fl. Car. 74. 1788. A. perennans Tuckerm. Am. Journ. Sci. 45: 44. 1843. Agrostis intermedia Scribn. Bull. Torr. Club, 20: 476. 1893. Not. Balb. 1801. A. pseudo-intermedia Farwell, Ann. Rep. Com. Parks & Boul. Detroit 11: 46. 1900. A. Scribneriana Nash, in Small, Fl. SE. U. S. 126. 1903. Culms 1°-3° tall, erect, simple, smooth and glabrous. Sheaths smooth, those at the base of the culm often crowded and overlapping; ligule 1"-2" long; blades 4'-9' long, 1"-3" wide, scabrous; panicle 4'-9' in length, the branches 1 1/2'-3' long, ascending, dividing at or below the middle, the divisions divergent, the pedicels ap-pressed; spikelets about 1" long, the outer scales acute or acuminate, scabrous on the keel; third scale about three-fourths the length of the first, smooth; palet small or wanting. In dry soil, Massachusetts and New York to New Jersey, Tennessee and Missouri. Aug.-Oct.